I love Beets. Papa Beet does not. So when I brought this Iced Beet Cake over to his house for him to try, I didn’t tell him at first that beets were involved. And he liked it. After I told him both the cake and the icing were made with beets he said he would eat beets this way. #Success. I will admit, this started as a brownie recipe and ended as a cake recipe. I got very excited when the batter was pink. I was thinking my cake would be pink and pink cake would set up some great pictures. However, it seems the pink just baked right out of the cake. Then again, if you are trying to disguise vegetables in a dessert than this isn’t such a bad thing, right? #Success. 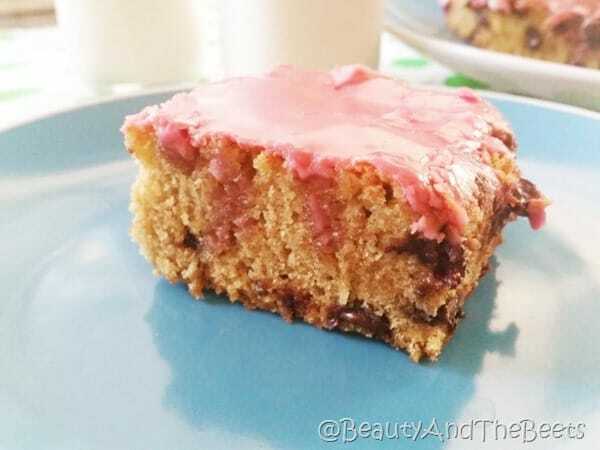 I actually ended up loving the cake-like texture, and I really loved the pink icing- I just made a glaze of confectioners’ sugar, vanilla extract and beet juice. And yes, I used canned beets. Not only did this save me about an hour of baking time, it also saved my kitchen from becoming a failed Pepto Bismol experiment. I tend to be a little messy when I bake and beet juice stains everything. Preheat oven to 350°. In a large mixing bowl, sift the flour, baking soda and salt. Set aside. In the bowl of a food processor, pulse together the melted butter and sugar until blended. Add the eggs, vanilla extract and maple syrup and process until mixture is smooth. Add the beets and again process until smooth. 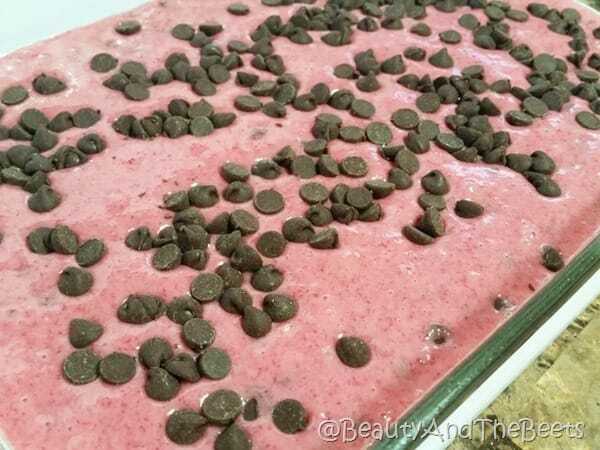 Pour the beets mixture into the sifted flour mix and stir gently until the dry ingredients are well mixed into the wet ingredients. Gently fold in one cup of the chocolate chips. 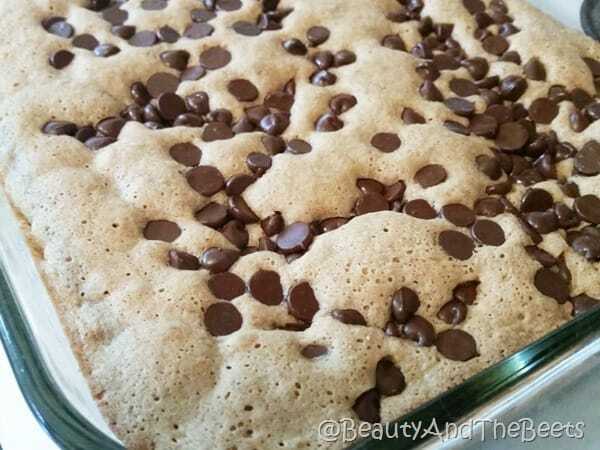 Spread the batter into a 13x9 baking dish and sprinkle the remaining chocolate chips on top. Bake for 25-30 minutes, until a toothpick inserted into the middle of the cake comes out clean. Place the sugar in a medium bowl and slowly stir in the beet juice and vanilla. Stir until the glaze is mixed well. Spoon or pour over the cake and spread evenly. Cut the cake into individual pieces and serve. So, what are your thoughts? Are you a fan of hiding vegetables into cakes and cookies? I sort of view this like eating carrot cake, and we all love carrot cake. There are so many people who are not fans of beets. And beets are most definitely misunderstood – every buffet across America has pickled beets at the salad bar. However, pickled beets are only one way to eat beets, but unfortunately, most people can’t move past those. 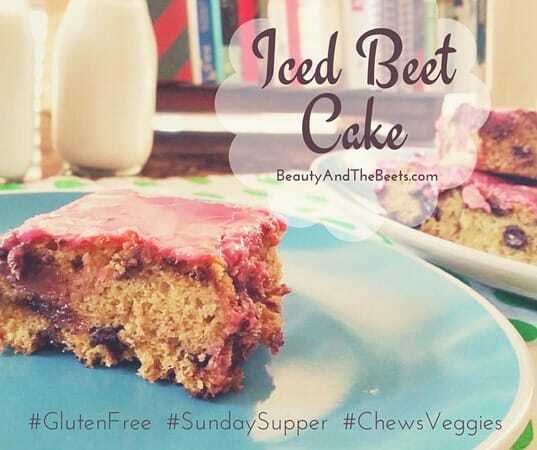 so I would love to know what you think about this Iced Beet Cake. Maybe I can finally get my hubby to eat beets, too! What a fun, yummy cake!!! I don’t like beets either, but I bet I would like them this way! What a great way to naturally color a frosting! This might be the perfect way to get my husband to open himself to beets! Really interesting how the pink baked out!! 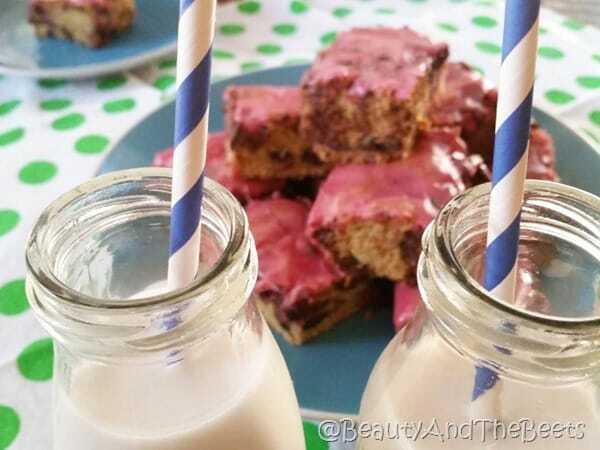 What a fun idea for a healthier cake! 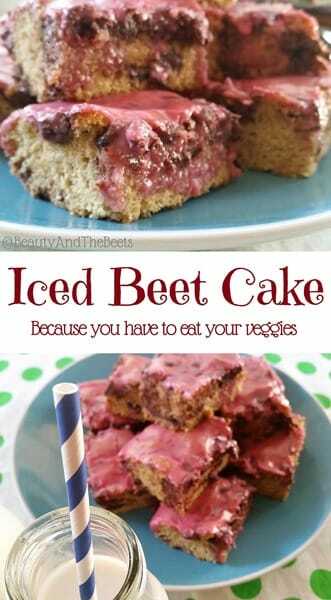 I love beets too…but I’ve never tried them i n a cake. Can’t wait to give this a try. I wonder if I could substitute Stevia for the sugar and vegan butter for the regular butter because this cake looks fantastic. My husband won’t eat beets either (even though I don’t think he has ever tried them :-)). I could fake him out with this cake. So fun! 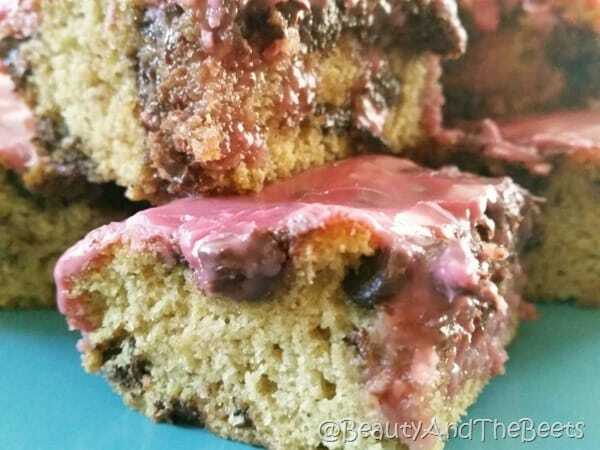 I want to try beets in brownies, but maybe I need to try your cake instead! 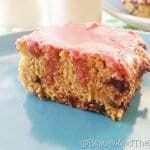 I love these beet recipes! People don’t realize how sweet they can be. And that color is so pretty. The icing color is just astonishing!